Regime change is a phenomenon which has occurred or occurs in almost every country in the world. Regime change is considered as the replacement of one system of government or administration by another system. A regime change can either be democratic or nondemocratic such as a military takeover/unconstitutional seizure of power. The democratic change could be termed electoral regime, while the nondemocratic change may also relate to military regimes. These two types of regime changes have a significant effect on a country’s system of leadership, administrative systems, governance, or bureaucracy. The military regimes are situations in which military officers are the main or predominant political personalities due to their use of force (Hadenius and Teorell 2006). The military personnel may exercise his or her political power either directly or indirectly (Hadenius and Teorell 2006). The extent of these regime changes (either democratic or undemocratic) has the potential to affect the sustainability of public administration systems to deliver good governance and social and economic development. Various regime changes both military (undemocratic) and civilian (democratic) have occurred in Ghana, and it is no doubt that these changes have had and continue to have a huge impact on the public administration systems in Ghana. The following sections are as follows: the literature on regime change theory, a brief history of Ghana and its regime changes, public administration in Ghana, discussion, and conclusion. Political regimes and regime changes are the main research in the field of Political Theory and Comparative Politics (Skaaning 2006). Political regime is defined as the formal and informal organization of the center of political power and its relations with the broader society, and it determines who has access to political power and how persons who have political power interact with those who do not (Lawson 1993). It is also considered as the rules and basic political resource allocation in which the political players exercise authority and power by imposing and enforcing the cooperative decisions on or within a particular geographical constituency (Kitschelt 1992). Political regimes, therefore, play important role in the determination and allocation of legitimate power and administration of power in a particular country (Zanger 2000). A political regime was also defined as the alliance of dominant ideological, economic, and military power players/actors influenced by the governors of the country (Mann 1993). A regime change, on the other hand, has been defined as a change or abandonment in the principles and norms governing the nature of a regime and has to do with the change in the institutional structure of the political regime of a country (Lawson 1993; Zanger 2000). According to Zanger (2000), the direction and focus of regime changes have to do with the changes made to the rules of the political game but not on changes in the leadership within a particular governing elite. He elaborated further that, for instance, if a new leader takes charge of a new government of a particular country without the corresponding effect of changing the rules of the political system, it cannot be seen as a regime change (Zanger 2000). A major distinction of a political regime change has to do with the change in the governing structure of the country which decides who has access or control over power and how such powers are utilized to handle those who do not have political power (Zanger 2000). Who has access to political power can drastically amend the extent to which citizen’s interests are treated, how they are governed, and how the larger interests of the populace are taken care off (Lawson 1993; Zanger 2000). Other principles defining political regime are the character of governors, access to power, vertical power limitation, and horizontal power limitation (Skaaning 2006). Political regime change is dependent on three causes such as the extent of economic development and performance, type of regime, and globalization which has a corresponding effect on the stability of a particular regime (Randahl and Vildö 2014). Detailed analysis of the causes of regime change showed and demonstrated that negative economic growth increases the risk of regime change in the ensuing year and also a higher level of GDP per capita has a constraining impact on the risk of regime change in countries (Randahl and Vildö 2014). According to Randahl and Vildö (2014), countries or states that have fairly young regimes/democracies are more prone to have a regime change as compared to countries with long years or tradition of democratic governance system that experience no risk of regime change. The nature of economic development within a country has an impact on the democratic or regime performance, and studies have demonstrated the link between economic development and performance on the regimes that exist in countries (Acemoglu and Robinson 2005; Bernhard et al. 2001; Diamond 2008; Przeworski et al. 2000). Countries that are developed economically tend to be more democratic due to two underlying reasons. The first is that when countries are more economically developed, the complexity of the social structures in such countries surges deepening the interaction between political institutions and labor which makes it hard for it to be controlled under an authoritarian regime (Przeworski et al. 2000; Randahl and Vildö 2014). Secondly, the survival of democratic regimes can be sustained for long periods in an environment which is highly developed economically (Przeworski et al. 2000; Randahl and Vildö 2014). Regime change can also be influenced by the kind of regime, the institutions, and how long such regimes have been placed (Randahl and Vildö 2014). Monarchy, military, no-party, one-party, and limited multiparty regimes are identified as some of the main kinds of authoritarian regimes (Hadenius and Teorell 2007). Monarchies are considered regimes in which a person of royal descent inherits the position of Head of State in accordance with accepted practices or by the constitution of in place at the time (Hadenius and Teorell 2007). On the other hand, military regimes are in states in which military officers are the main political actors through their perceived or actual force, and the military leadership exercises political power either directly or indirectly through civilian leadership such as civil service and other government institutions (Hadenius and Teorell 2007). This should be distinguished from situations where people with a military background are elected at the polls in open elections to lead organized by nonmilitary institutions which cannot be termed as military regimes (Hadenius and Teorell 2007). Under the one-party regime, only one political party is legally recognized, and all other parties are not permitted to contest or hold themselves in readiness of any elections. Two typical examples of such regimes are the People’s Republic of China and the Democratic Republic of North Korea. Lastly, the limited multiparty regimes tend to conduct parliamentary or presidential elections, and some political parties or leaders are made to take part. Globalization is considered as the expansion of economic transactions and the organization of economic activities across political boundaries countries (Nayyar 2015). It also has to do with a country’s deliberate attempts to open up its economy, foster economic interdependence, and cultivate deeper economic integration in the world/international community (Nayyar 2015). Globalization has also brought about the rapid spreading of political democracy around the globe particularly in developing countries and economics in transition (Nayyar 2015). Globalization has emerged as one of the major causes of regime change depending on the extent to which countries are exposed to the outside world. Factors such as international trade, financial integration, and political integration have been identified as the forms of globalization which has the potential to affect the sustainability and stability of regimes (Acemoglu and Robinson 2005). International trade has the ability to influence regime stability particularly in poorer and emerging democracies, and this influence can be in the form of increased wages of the poor in order to decrease the income gap between the poor and rich (Randahl and Vildö 2014). Closing the gap between the poor and rich will positively result in reduced conflict between these income groups there be creating increased political stability (Acemoglu and Robinson 2005). In addition, the increased financial integration as a result of globalization can bring about capital inflows which also close the gap between the haves and have not. Globalization also creates and opens brighter opportunities for the wider population in terms of job creation, etc. (Randahl and Vildö 2014). The political integration which occurs as a result of countries engagement in the international community can provide stability for democratic regimes because countries can suffer tougher sanctions when a legitimate democratic regime is toppled and hence this fear of tougher sanctions can reduce the risk of regime change (Acemoglu and Robinson 2005; Randahl and Vildö 2014). Ghana is the first country in Africa South of the Sahara to have obtained independence on 6 March 1957 from the Colonial masters. 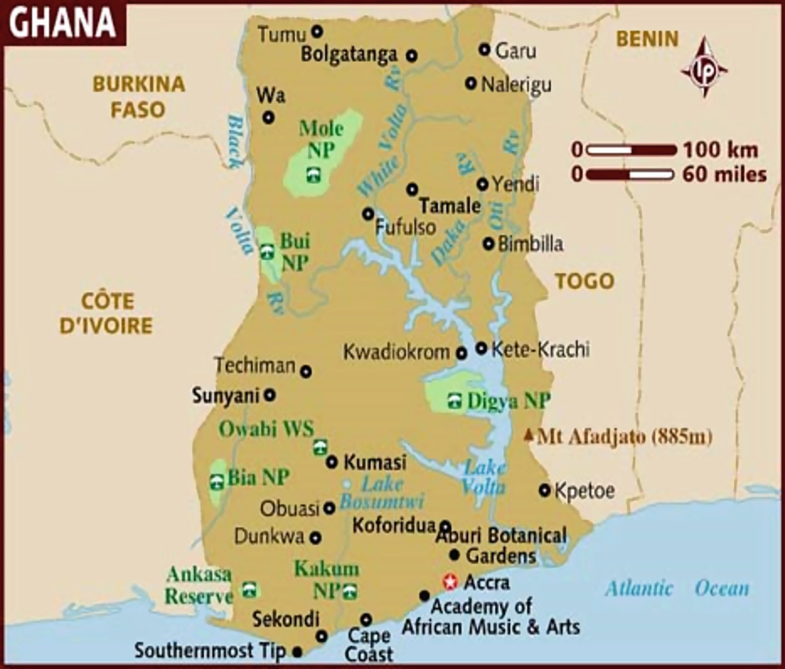 Ghana is located on the West Africa Gulf of Guinea and is bordered on the North by Burkina Faso, on the West by Cote d’Ivoire, and on the East by Togo. It has a land area size of 238,538 sq. km. Accra is the capital city of Ghana. As of 2016, the Ghana Statistical Service projected that the population of Ghana is about 28 million (Service 2016). The map of Ghana is illustrated in Fig. 1. Some of the major indicators about Ghana are displayed in Table 1. Ghana has undergone a number of regime changes from the time of pre-independence and postindependence eras. The pre-independence was under the British Government who ruled the then Gold Coast through a system known as the indirect rule. It is a system of governance where the people are ruled through local chiefs. A constitution was promulgated in 1951 to make way for an enlarged legislature comprised of members elected by popular vote either directly or indirectly. Later on 29 April 1954, a new constitution was formulated which established a cabinet that made up of African ministers from an all-African legislature by direct election. This then gave way for elections to be conducted and the Convention People’s Party (CPP) which had Kwame Nkrumah as its leader, won the majority of the seats in the new Legislative Assembly. In May 1956, the Prime Minister, Kwame Nkrumah, issued a white paper which proposed independence for Gold Coast. The British Government indicated that it will agree to the proposal for independence only after general elections were held and a reasonable majority was obtained. The elections held in 1956 saw the CPP returned to power winning 71 of the 104 seats in the Legislative Assembly. Ghana then became an independent country on March 6 after the United Kingdom renounced its control over the colony of the Gold Coast and Ashanti, the Northern Territories Protectorate, and the British Togoland. The postindependence of Ghana was characteristic of both democratic/civilian and military rule. These events are chronologically explained in the following paragraphs. Dr. Kwame Nkrumah who served as the Prime Minister of Ghana from 1957 to 1960 became the First President of Ghana in 1960 after the country became a Republic in July 1960. Ghana experienced the first coup in 24 February 1966, after the government of Dr. Nkrumah was overthrown by Major General Joseph Arthur Ankrah. The new military government regime led by General Ankrah was known as the National Liberation Council (NLC). The military regime declared that the aim of the coup was to end endemic corruption and change the constitution to get Ghana back to a democratic rule. The NLC was a provisional government, and in 1969 elections were organized, and a new civilian government was formed. Brigadier Akwasi Afrifa became the Head of State. He later organized elections and handed over power to Kofi Abrefa Busia. Edward Akufo-Addo became a ceremonial President of the Second Republic from August 1970 to January 1972 until he was overthrown in a coup d’etat. Colonel Ignatius Kutu Acheampong was the Chairman of the National Redemption Council who took over from 1972 to October 1975 and from 1975 to July 1979. Colonel Ignatius Kutu Acheampong was overthrown by his second-in-command Lt. Gen. Fred Akuffo who was the Chairman of the Supreme Military Council from July 1978 to 1979. Fred Akuffo was later overthrown in a coup d’etat by Flight Lieutenant Jerry Rawlings on 4 June 1979. He initiated measures to bring back constitutional rule, and he supervised general elections which was won by Dr. Hilla Limann in September 1979. Jerry Rawlings then handed over power to the Dr. Hilla Limann government. Dr. Hilla Limann was elected as the President of Ghana (Third Republic) in September 1979. His regime was short-lived as he was deposed in another coup by the Chairman of the Provisional National Defense Council (PNDC), Lt Jerry John Rawlings, in December 1981. This brought the Third Republic to an end. Lt. Jerry John Rawlings then established the Provisional National Defense Council (PNDC) of which he was the Chairman and the Head of State of Ghana. He later initiated processes to bring back the country to constitutional rule due to mounting pressure from civil society within and outside the country. Rawlings transformed the PNDC into the National Democratic Congress (NDC) which later contested for the 1992 general elections and won by a large margin. He then became the First President of the Fourth Republic. He was reelected again in 1996. He could not contest the 2000 elections due to the constitutional restrictions for a two-term limit. His then Vice President, late John Evans Fiifi Atta Mills, stood on the tickets of the NDC but lost to the opposition candidate John Agyekum Kufuor of the New Patriotic Party (NPP). John Agyekum Kufuor became the Second President of the Fourth Republic in Ghana after he won the second round of the general elections in 2000 against Prof. Mills of the NDC. President Kufuor’s regime lasted for years (two terms). He was not constitutionally permitted to stand for reelection, so Nana Addo Dankwa Akufo-Addo was elected as the NPP’s candidate but lost to the opposition leader of the NDC, Prof. Mills, who took over as President on 7 January 2009. After the 8-year tenure of the President Kufuor, Prof. John Evans Atta Mills became the Third President of the Fourth Republic when he won the general elections and was sworn into office on 7 January 2009. Prof. Mills, however, could not complete his full second term in office due to his unfortunate demise which occurred on 24 July 2012. His death paved for the then Vice President John Dramani Mahama to be sworn in as President to finish the second term of Prof. Mills. John Dramani Mahama was then elected by his party the NDC to contest the 2012 general elections of which he won against the opposition candidate Nana Addo. He then became the Fourth President under the Fourth Republic. He later went on to seek a second term but lost to the opposition candidate Nana Addo in the 2016 general elections. This ushered in Nana Addo who became the Fifth President of the Fourth Republican Constitution of Ghana. He was sworn into office on 7 January 2017, as the President of Ghana. His term will expire in 2020 but is legible for another 4-year term as stipulated in the Constitution of Ghana. The postindependence regimes elaborated above are displayed in Table 2. The nature of public administration in terms of its legal framework in Ghana has its origin in the 1992 Constitution under the Fourth Republic of Ghana. Specifically, Article 11 of the 1992 Constitution outlines the structure and sources of laws that regulate public administration in Ghana. This includes any enactments made by or under the authority of parliament and any order rules and regulations made by any person or authority under a power conferred by this Constitution. It also includes subsidiary legislation such as constitutional instruments, legislative instruments, executive instruments, instruments of a judicial character, bylaws, notices and statues, existing law, and common law. The public administration system defined by the 1992 Constitution stipulates that a President is elected for a maximum of two terms in office (4 years per term) and a national parliament/legislature which also has a 4-year term. It also outlines a functioning local government system in which assembly members are elected in all the 10 years of Ghana and ten Regional Coordination Councils to represent the interest of the central government in the respective regions. It also guarantees an independent judiciary, a professional and impartial civil service, the media commission which ensures the freedom of the press is not infringed upon, and a Commission on Human Rights and Administrative Justice which has the responsibility to protect citizens from injustices or abuse. The President is the Head of the Executive branch of Government. The Executive branch of Government is responsible for ensuring the functioning of the public administration systems/services in Ghana. Its ultimate responsibility is to implement the laws passed by the Parliament of Ghana. The members of the executive are largely drawn from parliament (the majority party in parliament). The President is also constitutionally mandated to be the Head of State and Head of Government and the Commander in Chief of the Ghana Armed Forces. The President is mandated to appoint persons to key public officers such as the Chief Justice, the Inspector–General of Police, and the Auditor General. The President makes these appointments in consultation with the Council of State and subsequent approval by parliament. The next person in the hierarchy at the Presidency is the Vice President who is performing presidential functions on behalf of the President if the President is out of the country, dies, or removed from office as stipulated in the Constitution of Ghana. In the absence of the Vice President and the President, the speaker of parliament is required to assume office. The Constitution also mandates the President to work with the cabinet. The cabinet is the body which is responsible for assisting the President in the implementation of public policy and government programs. The cabinet is made up of the President, the Vice President, and about 19 ministers of state. The ministers of state are appointed by the President with the approval of parliament to be in charge of a particular ministry such as health, defense, local government, education, etc. In addition to the sector ministers, the President also appoints the Regional Ministers with the approval of parliament. The Regional Ministers are mandated to represent the President in the respective regions, and they are in charged to coordinate and direct the administration and implementation of government policy in the regions. The Regional Minister also chairs the Regional Coordinating Council which is made up of the Regional Minister, his deputies, the President members and the District Chief Executives from districts in the region, two chiefs from the regional house of chiefs, and the regional heads of the ministries. As stipulated in the 1992 Constitution of Ghana, parliament is the legislative organ of Ghana which is reasonable for passing laws. Law-making is the ultimate function of parliament which is done through debates, passing bills which are assented to by the President before it becomes a law. Parliament is headed by the speaker who is in charge of all the proceedings of parliament by making sure that parliamentary protocol and procedure are duly followed. The members of parliament conduct their businesses through the chamber of parliament and several committees with the responsibility to scrutinize different bills, policy, and important public interest issues. In parliament, there are three main committees. These are the standing committees, select committees, and ad hoc committees. The standing committees handle issues that are very important to the house. Select committees have the responsibility to scrutinize the expenditure, the management, and policies of ministries, government departments, and other public agencies. The select committees are mandated by the standing orders of parliament to oversee particular ministries and government agencies such as the Ministry of Health, Ministry of Local Government, Ministry of Foreign Affairs, Ministry of Education, etc. Ad hoc committees are meant to investigate issues of high public interest or matters that do not come under any of the select committees. The judiciary is the organ of state which is mandated under the 1992 Constitution of Ghana to interpret the laws of Ghana. The judiciary is considered impartial and expected to be independent and subject only to the Constitution of Ghana. The judiciary is headed by the Chief Justice who is responsible for its administration and supervision. The Chief Justice is appointed by the President of the Republic in consultation with the Council of State and subsequent approval by Parliament of Ghana. The Chief Justice chairs the Judicial Council. The Judiciary Council is responsible for the administration of justice as stipulated under the 1992 Constitution of Ghana. The Council is expected to work independently in the interpretation of the constitution. Its functions include proposing of government judicial reforms to improve the level of administration of justice and efficiency in the delivery of justice. It also appoints and removes judges as well as other persons of the Judicial Service. The judiciary has two categories of courts: the Superior Court and the Lower Courts. The Superior Courts are made up of the Supreme Court, the Appeal Court, the High Court, and the Regional Tribunals. The Supreme Court is the highest court in Ghana. It has exclusive jurisdiction over constitutional matters and has supervisory jurisdiction over all the courts in Ghana. Regime changes are obvious as a result of discontent with the state of affairs existing within a particular regime which may be underpinned by political, economic, and globalization factors. The effect of regime change does not only affect the regime that existed at the time but importantly the public administration systems of the entire country. Regime change whether democratic/legitimate or undemocratic or illegitimate curtails the smooth administration of public state institutions meant to provide sustainable public administration system for effective public governance. Ghana as a democratic state has gone through several phases of regime change both military and democratic regimes. These regimes (military and democratic) were all instrumental in shaping the public administration systems in Ghana positively and negatively. In addition, regime change affects the implementation of public policy programs of governments, and so, for instance, in Ghana, political parties will choose to implement short-term programs or policies which will earn them votes in the short term instead of focusing durable and sustainable policies which will have a long-term effect. One other aspect of regime change effect on the public administration system is that heads of civil and local government agencies have unsecured tenure of office, and so when the regime changes, then their job goes with the regime as well. This practice has negative effects in identifying and sustaining well-performing heads or manager of the public sector that can implement and deliver good public policy in areas like the education, health, job creation, agriculture, economy, etc. This insecure tenure of office as result of regime change through democratic elections in Ghana is one of the major factors hampering the smooth operation of public administration in Ghana to effectively deliver good public policies which have a long-term impact on the general population.